I’ve bought these in march of 2018 and was planning on making an unboxing post, but a lot has happened since then. So now I’m making the combination with a review. 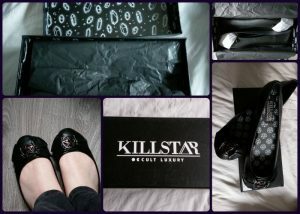 These are the Killstar Evelyn Flats and I’ve bought them to wear to a wedding from a niece of my boyfriend. I really love them and was really happy with the fact that you can tie a ribbon around the pentagram so you can’t offend anyone, because I didn’t knew all of the guests. The other reason that I chose these flats, is because I think they are really cool. Update 12-01-2018: I’ve owned them for about 7 months. I still think that they are comfortable to walk in, but not for long walks. And I still love them as much as I did when I first got them.